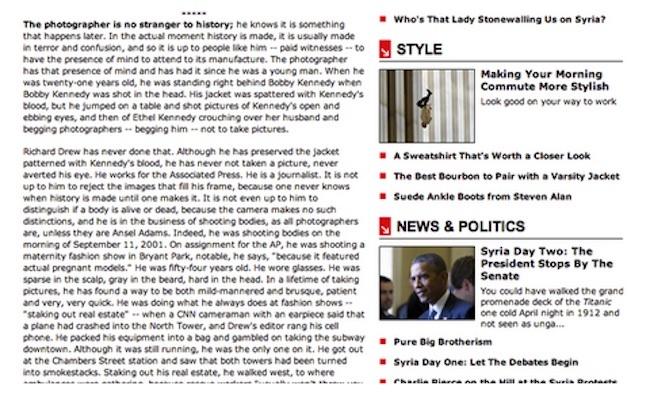 ON this 12th anniversary of 9/11, Esquire magazine reproduced the essay The Falling Man. It’s a picture of man falling to his death from the World Trade Center. Dwelling on one photograph of a man hurtling towards his demise is unpleasant. If you find him, then what – get his loved ones to sign the photo and explain how they feel seeing it? But then it gets worse. 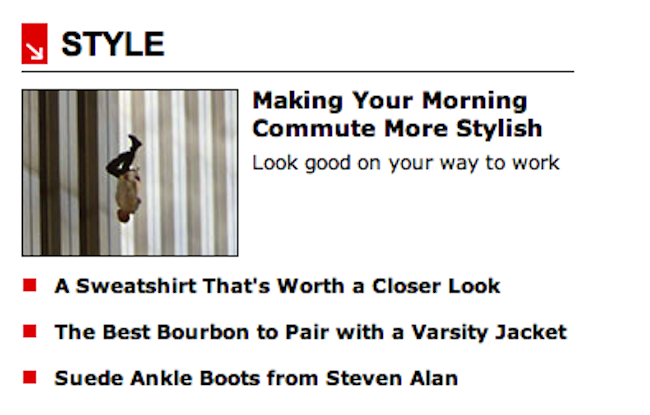 Esquire uses the picture to advertise a feature entitled: “Making Your Morning Commute Mote Stylish”. Relax, everybody. There was a stupid technical glitch on our “Falling Man” story and it was fixed asap. We’re sorry for the confusion.